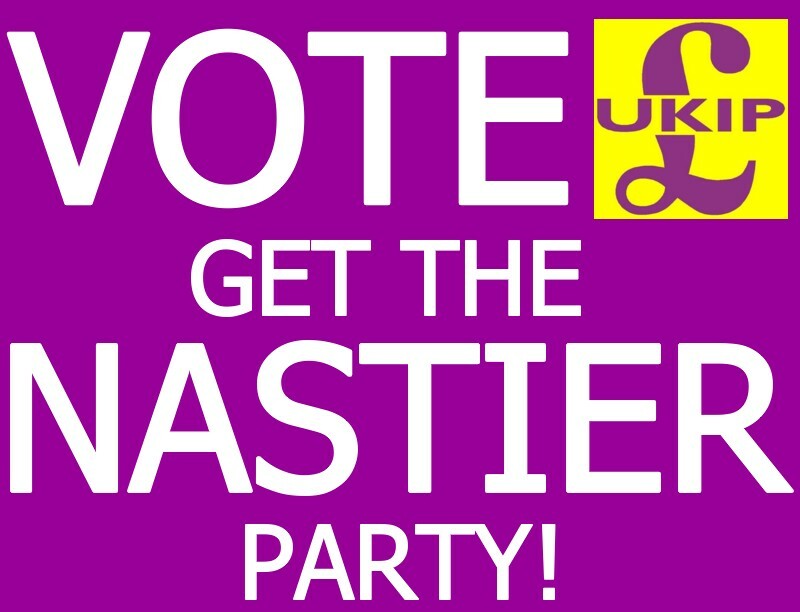 UKIP wins in Clacton – but what does it mean? He’s wrong, of course. People aren’t thinking in those terms at all. It’s just a shame that they are also wrong; Carswell is still a Conservative – all he has done is swap a conservative party for another conservative party, that is more extreme than the one he just left. The other notable factor in yesterday’s by-elections is the BBC’s continuing (if tacit) support for UKIP – which can be seen most clearly in its references to the Heywood and Middleton election. “Labour held on to Heywood and Middleton but UKIP slashed its majority to 617,” states the BBC report, which merrily misses the fact that UKIP remains unable to take Parliamentary seats from Labour. Labour supporters don’t want UKIP. Labour supporters don’t need a political party that is more regressive than the Tories. Labour supporters agree with Ed Miliband, that UKIP “do not represent the interests of working people”. Read between the lines. Who was UKIP’s candidate in Heywood and Middleton? The BBC report doesn’t name this person until very far down its story. If you read the mass media coverage, you’ll think UKIP was the only party in these by-elections. Don’t. If we are to learn anything from the result, it is that the Conservative Party is in deep, deep trouble. providing the analysis that the mass media won’t! The almost total collapse of the Tory vote in Heywood was the cause of the near miss, plus there was really bad weather, and that always affects by-election turn-out. The BBC missed the opportunity to spell out the real story – the total collapse of the Tory vote in both by-elections, and that Lynton Crosby didn’t expect that to happen with his “all the same” dog-whistle strategy. Having said that, I hope that by the time of the GE the people in Clacton will have ample opportunity to see what they have bought into with UKIP, and decide that their MP will be judged by the company he keeps. All I see is voters with no real choice. They voted for the devil they knew even though it was just wearing a different suit and tie and that is sad. With UKIP clouding the issue and openly sporting it’s rats from the sinking Tory ship as their own, is it any wonder why people are getting confused. Yet is there a viable alternative to the same tired way of doing things? Currently I think not. As for the sheeple and the upcoming general election? They’ll just vote according to the wishes of the media, as always.